Colorful is one of the top NVIDIA authorized partners in channel sales throughout North America. Based on the philosophy of intelligent innovation, market knowledge, and the real-time operation, Colorful continues to identify the need in the marketplace and providing the solution to that need. By offering product differentiation, 24/7 tech service, a 90-day Step-Up program, and other customer focused programs, Colorful is a clear leader in all categories: etail, retail, distribution, and system builders. With headquarters in Brea, CA, Colorful’s global coverage includes Colorful GmbH in Munich, Colorful in Miami, and Colorful Hong Kong. I will be looking at Colorful iGame GeForce GTX 1050Ti Vulkan U 4G EC which is their highest end offer in the line of the GTX 1050Ti. 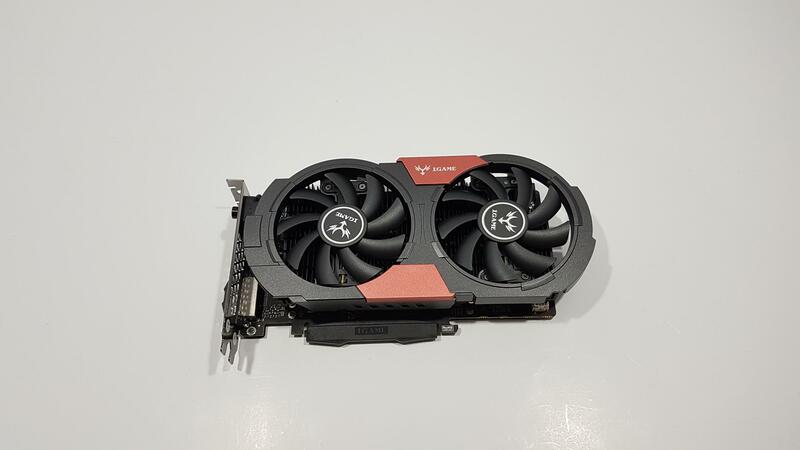 This is one beautifully designed card and within this price range, we have a custom PCB, a 6 pin power connector, iGame Full-armor backplate, Silver Plating technology, one-key overclocking to name a few of the functional aspects. 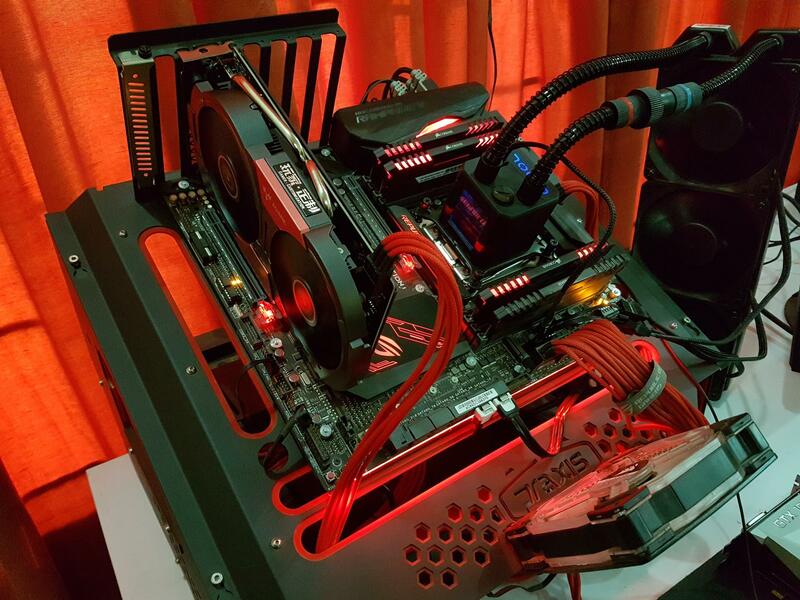 How has this card performed on our test bench? Let’s find out. 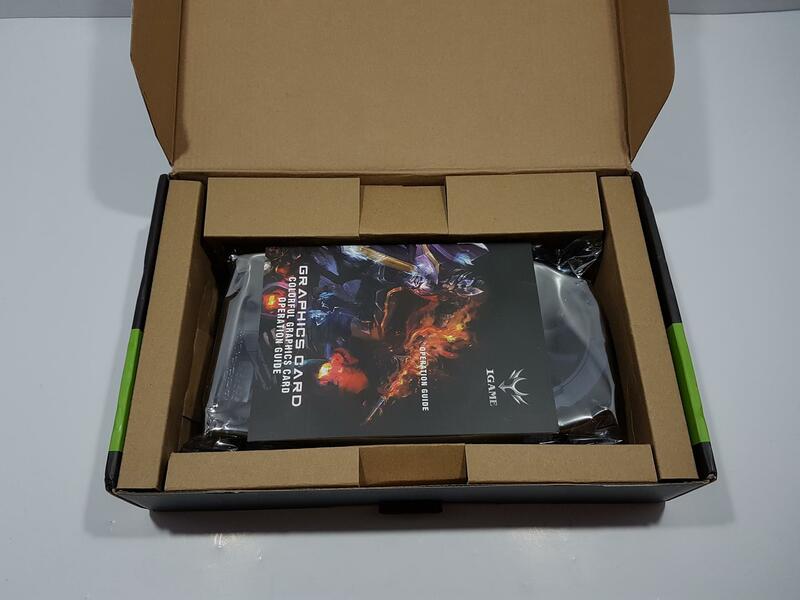 The graphics card comes in a cardboard box retail pack. On the top cover, we have an iGame brand name and the logo printed on the top left corner in the red color. Nvidia GeForce GTX logo is printed on the top right side. 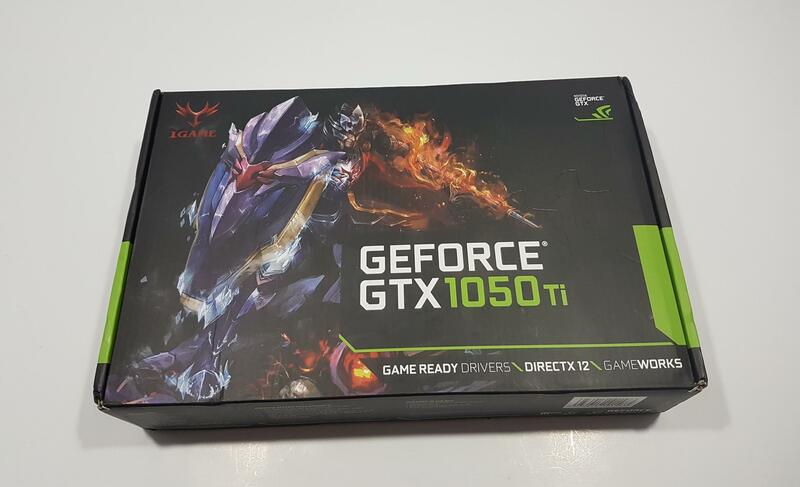 GeForce GTX 1050Ti is printed under the anime character picture. Salient features of the Pascal are printed on the bottom right side. 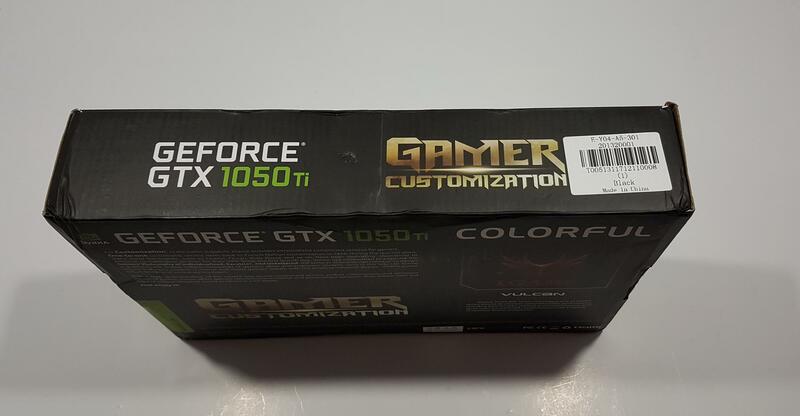 The backside of the box has the Nvidia logo printed on the top left side. The graphics card model is printed on its right side. Colorful is printed in the white color on the top right side. 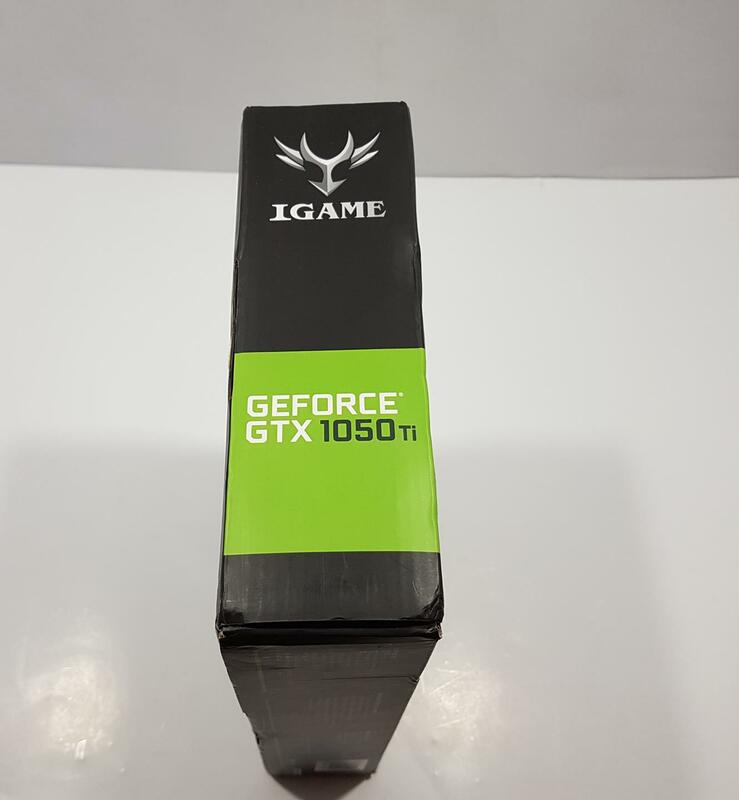 iGame brand name and logo are printed under it. Vulkan is the premium, main streamline of the graphics cards from the Colorful focusing on the sheer performance, design, customization and powerful cooling.The company’ss the contact address is mentioned at the bottom left side. The left side of the box has iGame brand name and logo printed in the white color on the top side. 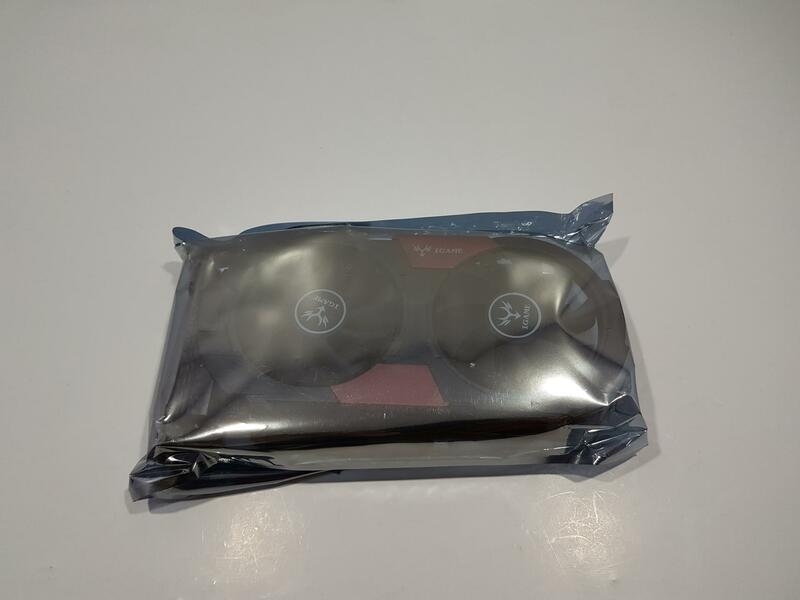 The graphics card model is printed on the bottom side. 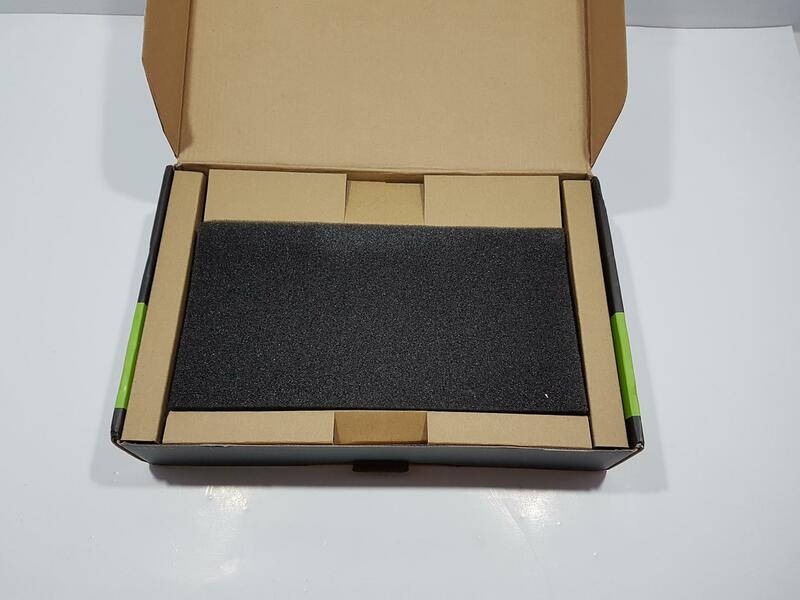 The right side of the box has iGame brand name and logo printed in the white color on the top side. The graphics card model is printed on the bottom side. There is a serial no sticker pasted under the iGame brand name. The rear side of the box has the graphics card model printed on the left side. Gamer Customization tag is printed on the right side followed by the EAN sticker. Contents of the box are printed next. Opening the box would show the soft dark gray color Styrofoam padding covering the contents. Removing it would show the graphics card nicely tucked inside the anti-static plastic sheet. 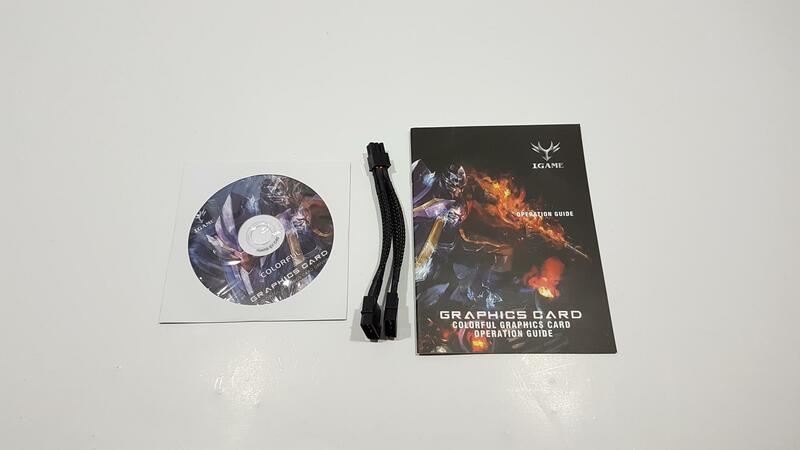 The operation guide and the installation disk are placed on the top of the graphics card. There is Styrofoam padding on the bottom of the box for further protection. A 6-pin PEG cable with two Molex connectors in case PSU does not have a PEG cable. Personally, I don’t prefer this implementation. Cables are individually braided, which is a thumbs up. Before digging into the design elements of this graphics card, let’s first talk about the Gamer Customization as this tagline catches my attention. iGame provides personalized customized services for gamers. Since their launching, the iGame has been collecting thousands’ of gamers’ ideas and engineers’ wisdom. Going that route the iGame has ensured that each of their product is unique and meets the gamers’ needs particularly focusing on the design elements of the cards, the power delivery components and their design, the cooling performance and other unique technologies. iGame VULCAN series is their largest one of the product lines. It features the ultimate performance level that gamers’ would eye for coupled with the cooling and customization with the variety of the iGame accessories. The Colorful iGame GeForce GTX 1050Ti Vulcan U 4G EC is their top-notch gaming solution in the GTX 1050Ti category. I got to get my hands on it to test it out myself. This is my first ever Colorful graphics card and I must admit, after putting it through the games, synthetic benchmarks and overclocking it has amazed me and earned my praise. Let’s take a look at the design of the card. Due to the warranty consideration, I did not open the card to take a look at the PCB and VRM/MOSFETs. The graphics card out of the box speaks for its bold yet beautifully designed shroud. The left side of the card has a cooling shroud. There are two 90mm fans on it which the iGame has referred to as Blaze DUO cooler. We get to have not one but two 90mm fans to deliver the ultimate cooling performance. Majority of the other solutions boast 80mm fans for the cooling need but iGame seems to have taken the cooling perspective seriously. Each fan has a sticker pasted on the rotor hub. Each sticker has iGame brand name and logo printed on it. The shroud is made of the plastic but mind you, it is nowhere cheap from anywhere. Build quality is top notch. The shroud does not have a rectangular design but it follows the symmetry of the fans. On the top side of fans the shroud edges are circular with the middle section being a straight line implementation. There are two red color shroud parts implemented in the red color. The top one is aligned with the right fan while the bottom is aligned with the left fan making the overall design and looks symmetrical and pleasant. The top red part has the iGame brand name and logo printed in the white color. 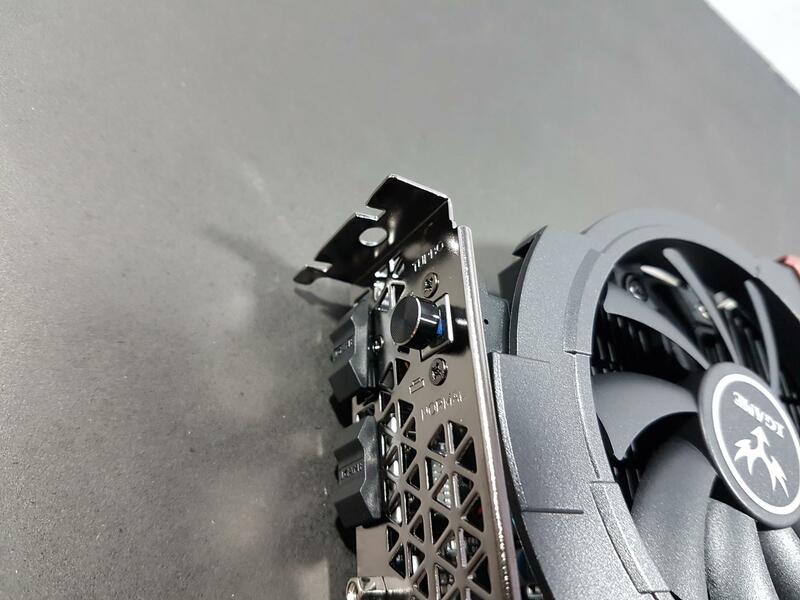 The shroud part across the fans borders have raised edges with breaks which really adds to the looks. Focusing on the cooling solution, this card has a single aluminum heat sink which to my liking is in black color. Hats off to the design team. There is more. There are two nickel-plated copper heat pipes each of 8mm. 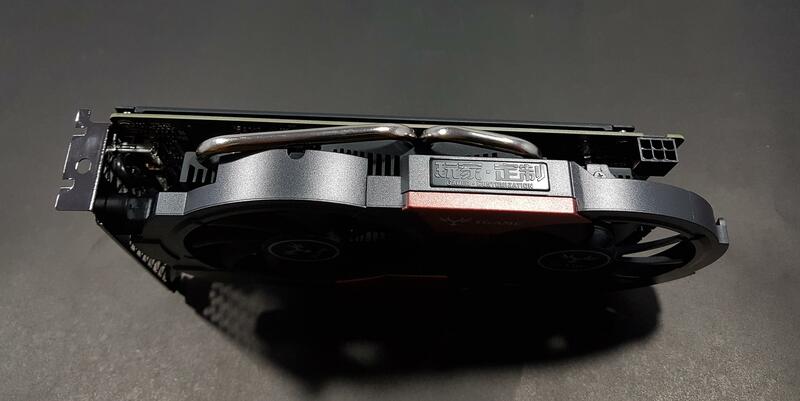 From what it looks like from the bottom side, they seem to be making direct contact with the GPU die for better heat dissipation. The heatsink has a stepped design. The heat sink is making a direct contact with the GPU die in the middle. The left and the right sides have less height to them and they don’t make contact with the PCB but with the fans. There are approximately 70 fins making up the fin stack and that is not all this is a jointless fins assembly. Let’s take a look at the bottom side of the graphics card. We can see that the color of the PCB is black. The backplate is secured with the 6 screws. 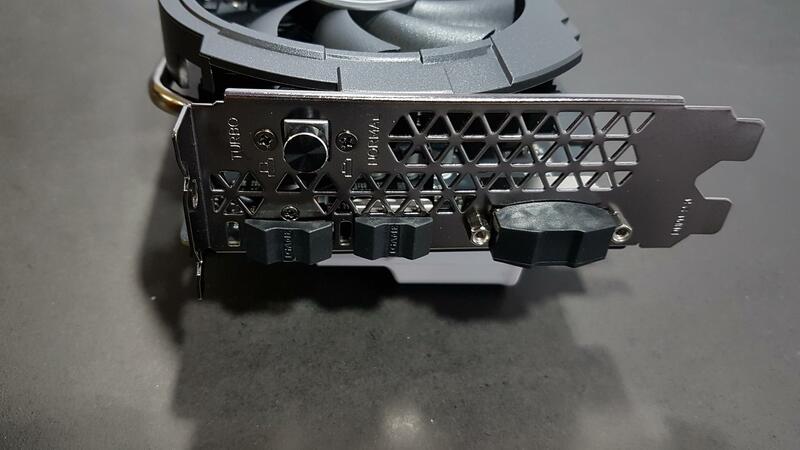 Unfortunately, the screws head side is not on the backplate but on the PCB so if you have to take off the backplate, you would need to take off the heatsink and fan shroud first to access the top three screws securing the backplate. The bottom screws are accessible though. 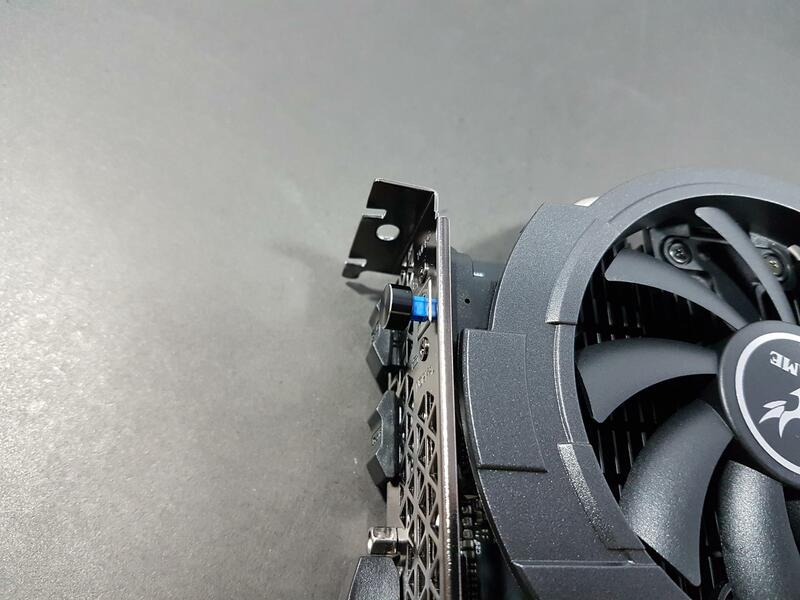 On the far right side, there is a 4-pin power connector to the fans. Yeah, you read it right, it is a 4-pin. The left side of the fan shroud is not fully covering the PCB from the I/O side. There are two screws securing the shroud with the heat sink. Under the red color block, there are vents for better airflow. They are implemented in an angular manner giving them good looks. Let’s take a look at the top side. From this angle, you can clearly see the black color heat sink. There are two screws securing the shroud with the heat sink. The heat pipes are coming out of the heat sink and have more height to them making them visible on the top of the shroud. On the top of the shroud adjacent to the red color block, There is a black color mount with GAMER – CUSTOMIZATION printed. This part does not have any LED under it otherwise this would have been a good add-on. The heat sink is secured with the PCB using the long tabs. The 6-pin power header is on the right side of the PCB. The PCB has no SLI finger as Pascal based GTX 1050Ti does not have SLI support. There is an iGame Full Armor backplate on the backside of the card. The backplate is covering the entire PCB. It has a concept design of the iGame brand portrayed in a bold manner with red and black color patterns. 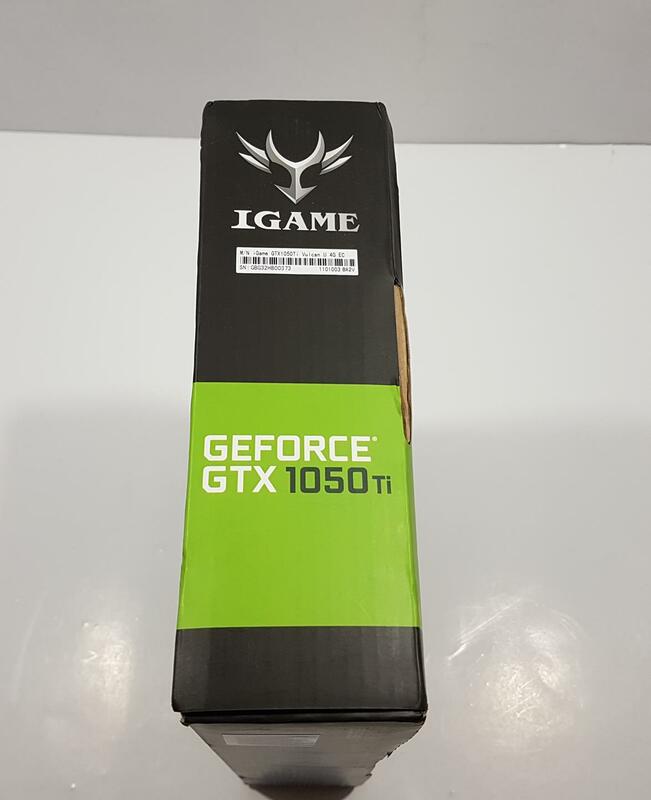 There are an iGame brand name and logo printed as well. There are two stickers pasted on the right side. The top sticker has a complete model and the serial no of the graphics card printed on it. The second sticker has a country of manufacturing info along with other certification compliance info. Graphics card is made in China. There are 4 spring loaded screws securing the PCB with the heatsink, not the backplate. There are 4 other screws as well which are hooking the PCB with the heatsink. We can see the terminating end of 6 screws securing the backplate with the PCB. There is a sticker pasted on the opening side of one the spring-loaded screws. Tearing or removing it would void the warranty. The front side of the card shows that the fan shroud extends the length of the PCB. This is a same design concept that what we saw on the Maxsun GTX 1050 that we have reviewed earlier. The far end of the black color heatsink is visible. The power cable for the fan is being routed on the right side. Please note that the heat sink is terminating right where the PCB is terminating. This is a well thought out design. There is a pressed down button on the top left side of the I/O shield. It has Turbo written on top of it and Normal under it. If it is pressed in the card will be in the normal mode but if it is pressed up indicated by the blue color portion of the slider, the card will be in the OC mode. This is what the iGame refers to as One-Key overclocking. Please see the specifications section to see the change the clocks associated with this button. The card is using advanced silver plating technology PCB as compared to the traditional copper-based PCBs. This technology helps in reducing oxidization and improving the PCB integrity for superior stability up to twice as compared to the traditional PCBs. The PCB is using the I.P.P Digital Power Supply which enables the power delivery components to achieved lower DC impedance than same size inductance with lower working temperatures and lower EMI. The settings on which the games were tested are mentioned in the graphs. Microsoft Windows 10 x64 version 1709 was used. Nvidia graphics driver version 388.71 was used. FPS were monitored using MSI AfterBurner 4.4.2 Game settings were set from within the games, not from the GeForce Experience. All the reported framerates are average FPS. Previously Unigine Heaven and Valley were a part of our testing but they have been dropped and only superposition will be featured. 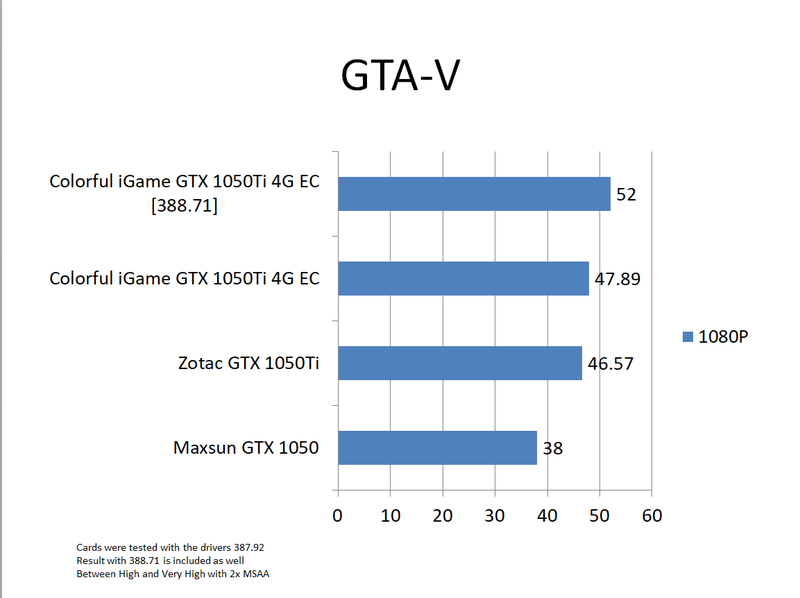 The Zotac GTX 1050Ti, GTX 1050 were tested earlier with 387.92 drivers when they were tested for the review. 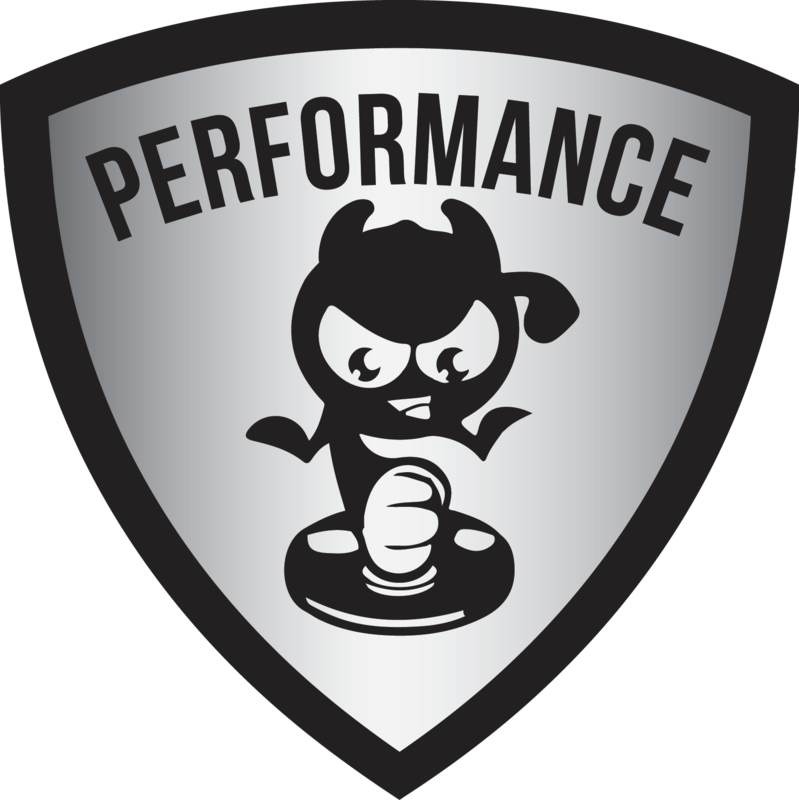 Nvidia’s latest drivers have seemed to boost the performance between 2 to 5 FPS on average depending upon the game. 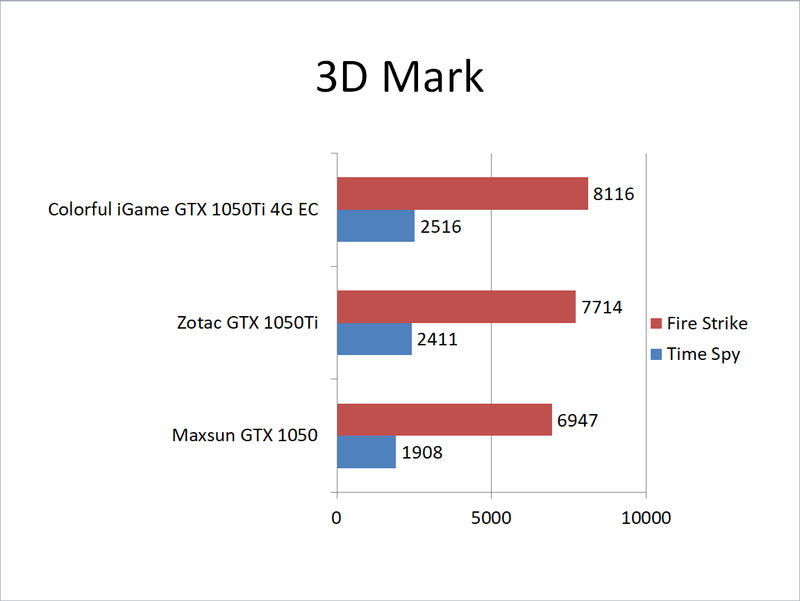 We have tested the Colorful iGame GTX 1050Ti Vulcan U 4G EC with the latest driver 388.71 as well as with the 387.92 to ensure the standardization between the testing. 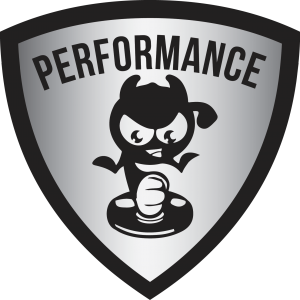 Let’s take a look at the performance graphs. 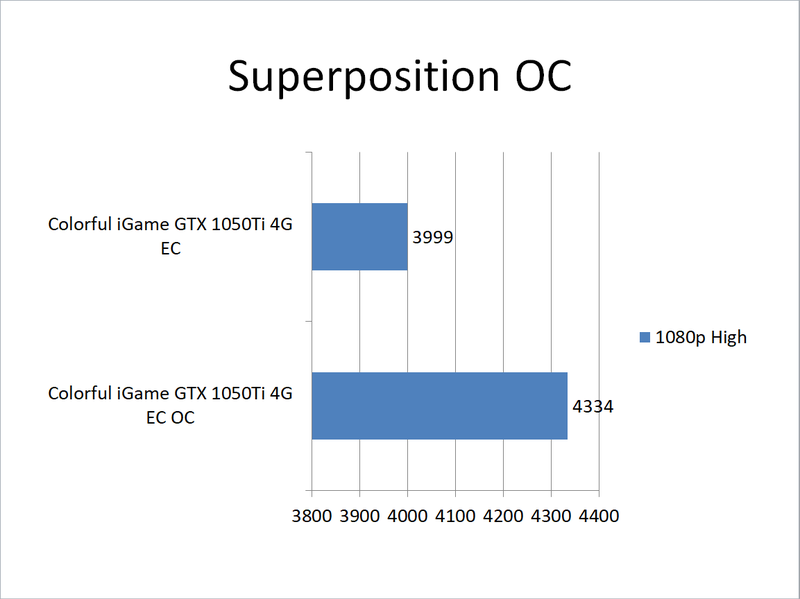 These are the graphics score only. The Colorful iGame GTX 1050Ti Vulkan U 4G EC takes a lead all over. 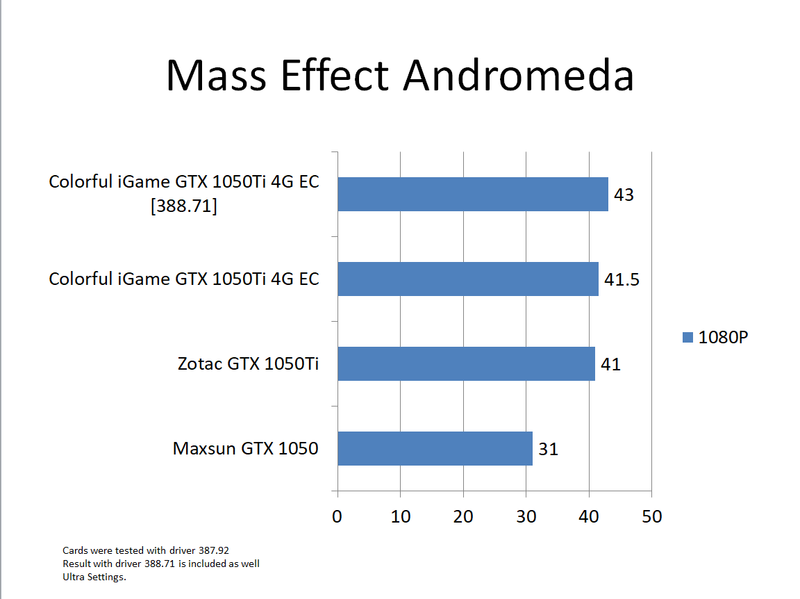 The card was tested with the High to Very High settings and 2x MSAA. The card was tested in the Ultra settings. 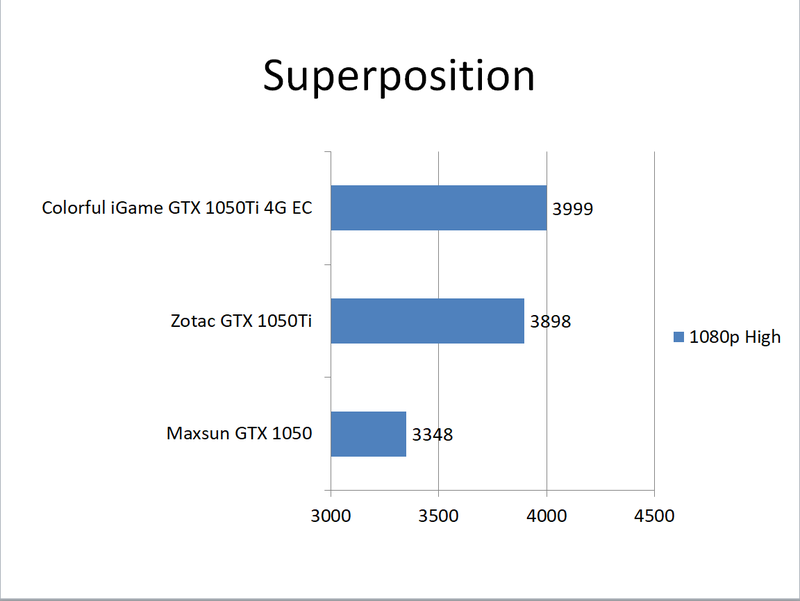 With driver 387.92 the iGame GTX 1050Ti Vulcan U 4G EC was behind the Zotac GTX 1050Ti OC by 1 FPS margin. This is the only game where the iGame card was behind the Zotac card. 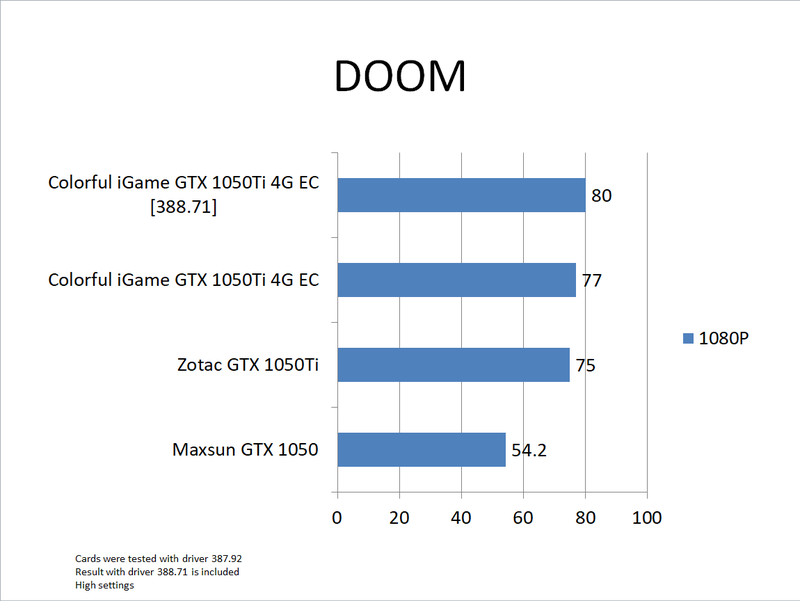 DOOM was tested using the High settings. The performance is right on the money for this card. 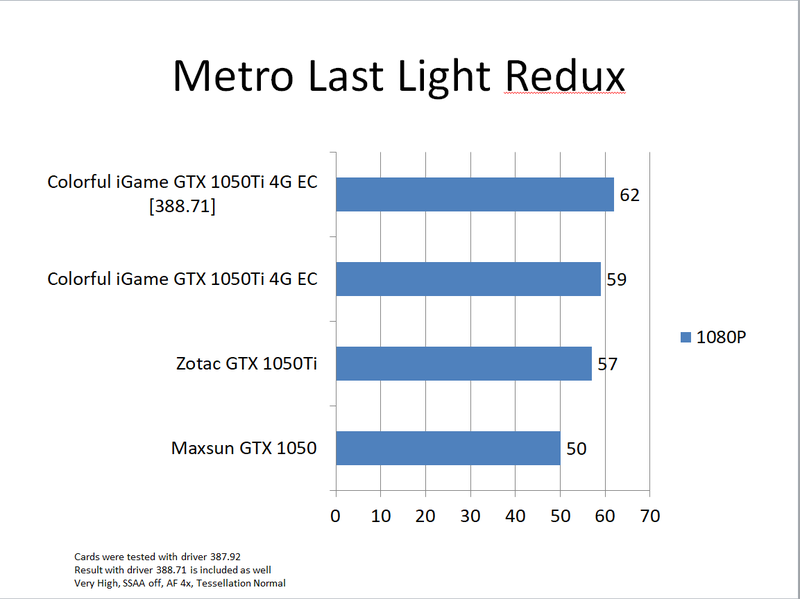 Metro Last Light Redux was tested on Very High graphics settings with AF 4X and SSAA off. Motion Blur and the tessellation were set to Normal. The Colorful iGame GTX 1050Ti Vulkan U 4G EC takes the lead. The game was tested on High settings with 2x MSAA. The game was tested in High settings. 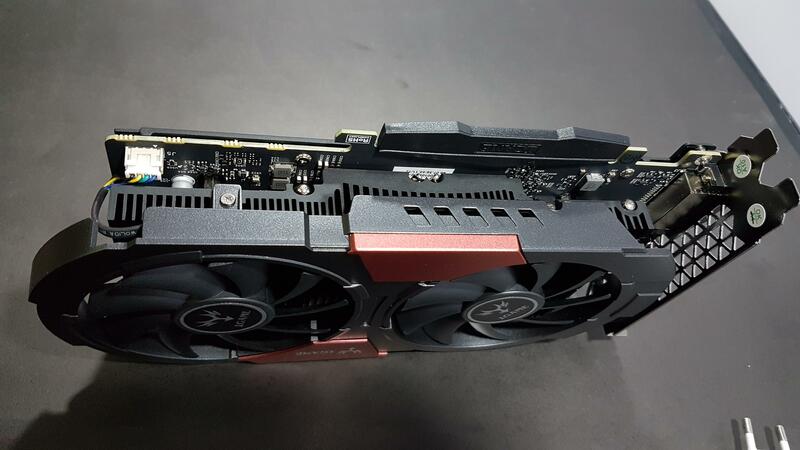 The Colorful iGame GTX 1050Ti Vulkan U 4G EC almost reaches the 60 FPS milestone. The card boosted to 1882MHz out of the box. During my overclocking session with this card, it reached 1974MHz boost clock with +150MHz on the core clock and the +250MHz on the memory clock. The result is impressive. Room temp was 20C at the time of the testing. In an open bench table, the maximum temperature hit by the graphics card was 60C. With overclocking, the max temperature was 65C. Mind you this temperature reading is taken after 15 minutes run of the Furmark and the CPU was also stressed test at the same time using AIDA64. 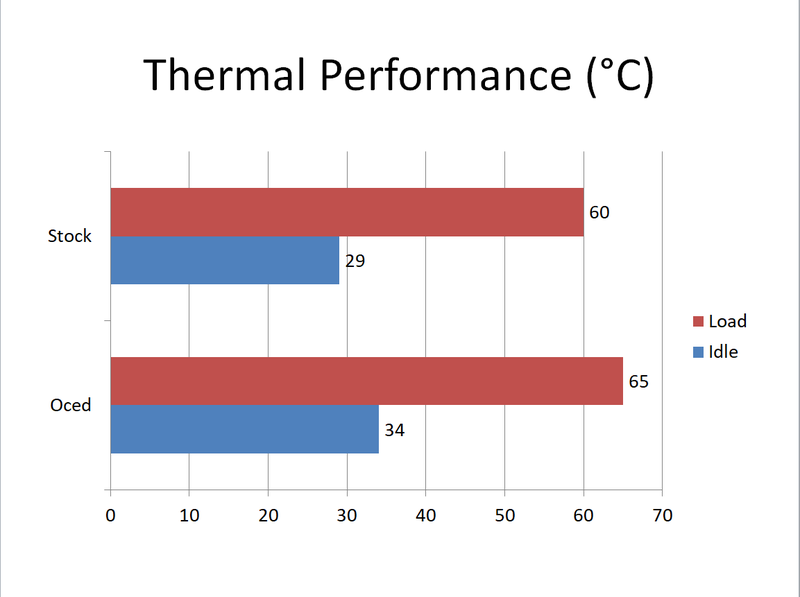 Thermals are very good speaking of the cooler’s performance right on the money. Fans were left on default fan curve. Foneso Digital Sound Level Meter version A0 was used to test the sound level. 36dB is heck impressive for the cooling that this card provides. The Corsair AX1200i is a digital PSU with monitoring enabled on the power consumption. 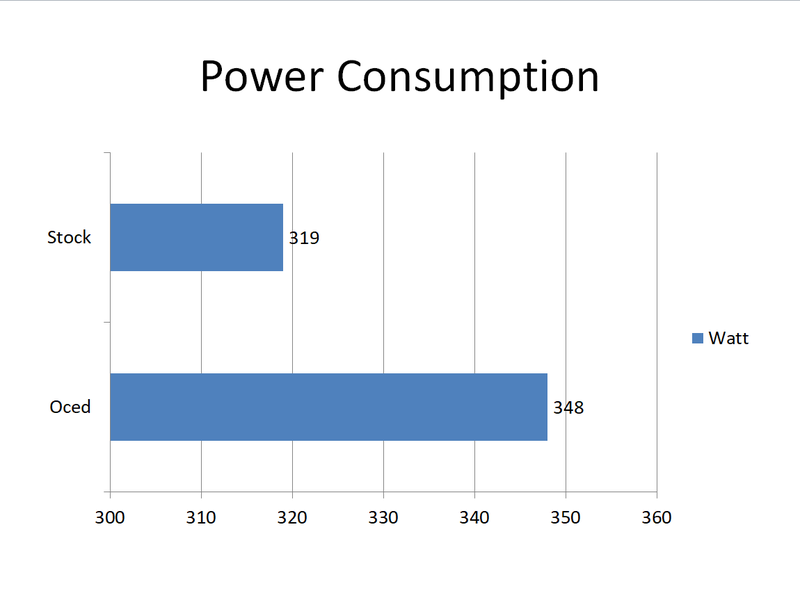 Corsair Link was used to checking the power consumption under stock clocks and overclocked clocks. The Furmark and AIDA64 were run at the same time to check the power consumption of the system. The Colorful iGame GeForce GTX 1050Ti Vulkan U 4G EC is the highest end offering in the category of the GTX 1050Ti. It features Nvidia’s 14nm GP107 chip with Die size of 132mm² and 3300M transistors. It packs 32 ROPs and 48 TMUs with 768 CUDA Cores. It has a pixel fill rate of 44.2 GP/s and texture fill rate of 66.2 GT/s. 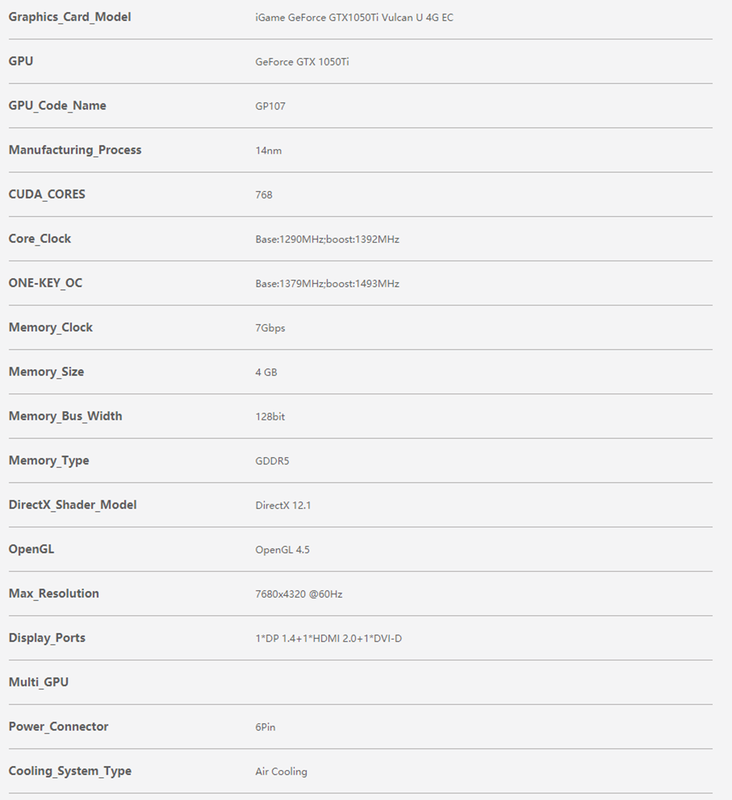 The card has 4GB of Micron GDDR5 VRAM clocked at 1752MHz with 128-bit interface and bandwidth of 112.1 GB/s. Default Clock is 1380MHz with the boost clock of 1493MHz. The card has a beautiful and symmetrical design overall. The cooling department is strong featuring two 90mm fans termed as Blaze DUO and an aluminum-based black color heat sink having two 8mm nickel coated copper heat pipes. The heat sink has jointless fins assembly and the stack has stepped design. There is no LED gimmick on this card though the black mount on the top side of the shroud would have looked badass with the RGB lighting solution. The shroud has two red color blocks on its front side. The top one has an iGame brand name and logo printed in the white color. 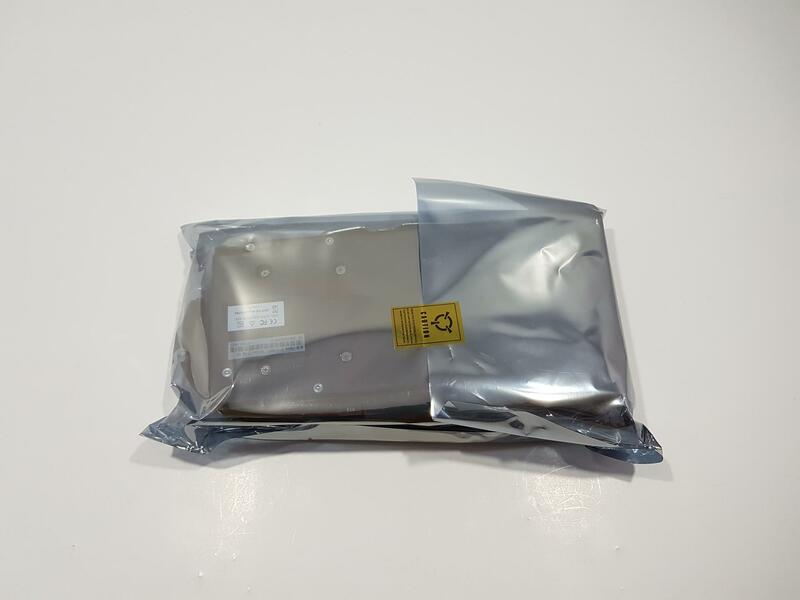 The protective covers on the PCIe connector and on the I/O shield ports are made of soft plastic and they have iGame printed on them as well. The dimensions of the card are 245mm x 125mm x 39mm (L x H x D). The build quality is rock solid. The card has a Full-Armor backplate which is secured with the PCB using 6 screws all of which are mounted on the PCB side. In order to take off the backplate, the heatsink would have to be removed. The heatsink is secured with the PCB using 4 screws. The shroud is secured with the heatsink using 4 screws as well. There is a pressed down button on the top left side of the I/O shield. It has Turbo written on top of it and Normal under it. If it is pressed in the card will be in the normal mode but if it is pressed up indicated by the blue color portion of the slider, the card will be in the OC mode. This is what the iGame refers to as One-Key overclocking. In terms of connectivity, we have a DisplayPort 1.4, HDMI 2.0 port and DVI-D port. The card is listed at $185.99. I have put the card to test out on the Full HD resolution using the graphics settings between High and Ultra. 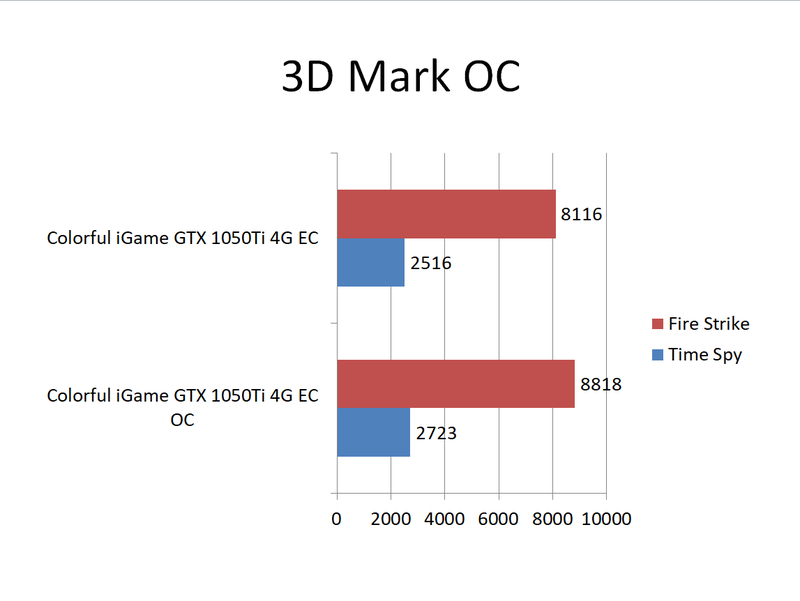 The graphs are speaking for the sheer performance of this graphics card. The new drivers coupled with this card are too damn good for any gamer playing on this resolution and yet on the budget. 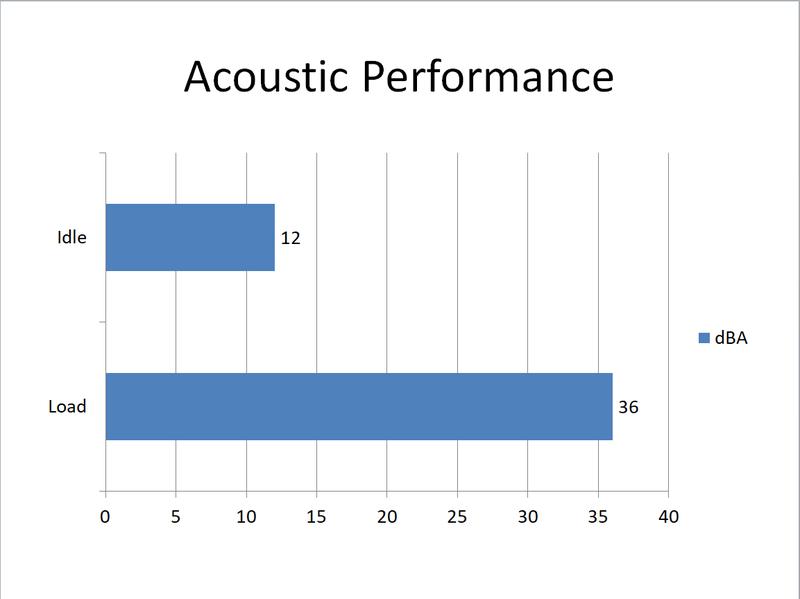 The performance is right on the money. 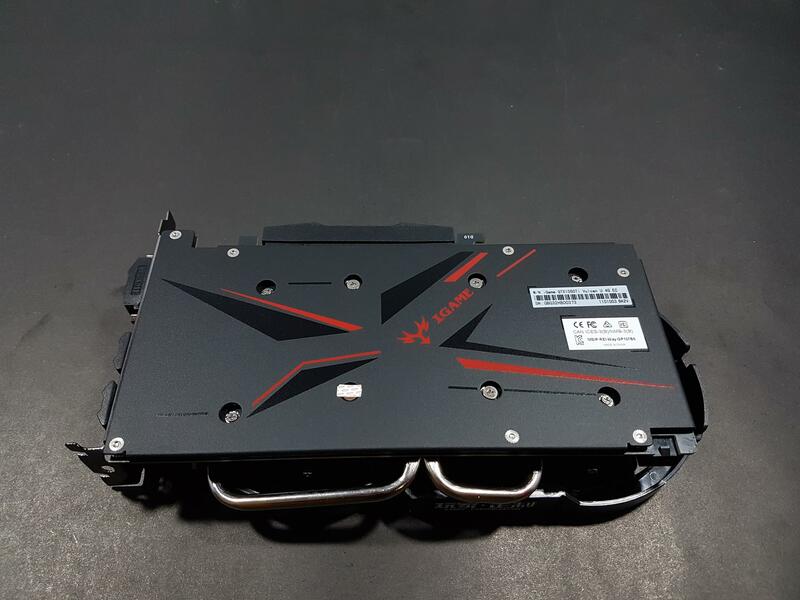 The Colorful iGame GTX 1050Ti Vulcan U 4G EC has been tested with 388.971 and 387.92 drivers. 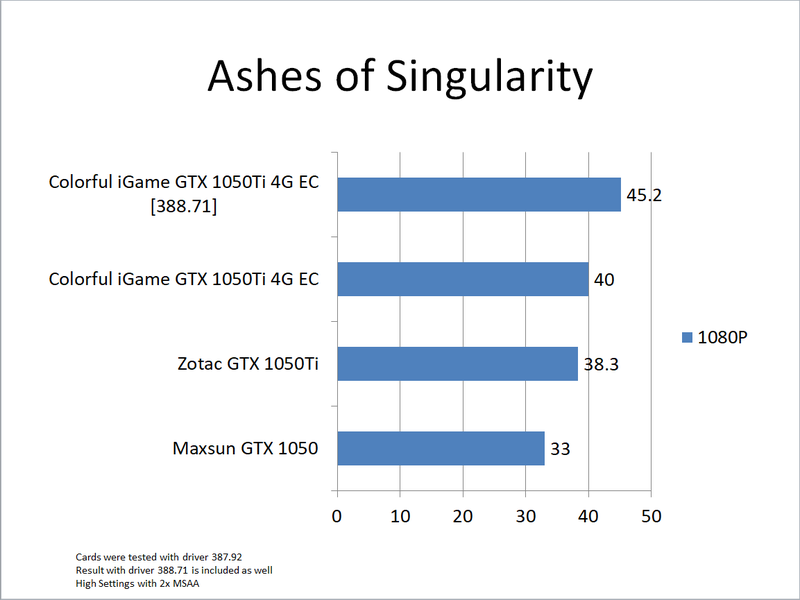 This is because the Zotac GTX 1050Ti, GTX 1050 were tested earlier with 387.92 drivers when they were tested for the review. 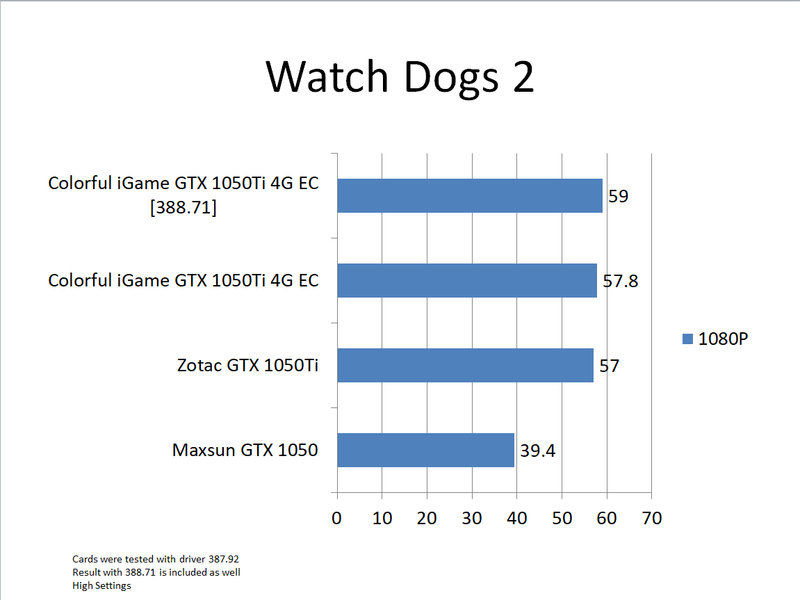 Nvidia’s latest drivers have seemed to boost the performance by 2 to 5 FPS on average depending upon the game. Even with the drivers 387.92 the Colorful iGame GTX 1050Ti Vulcan U 4G EC has delivered excellent performance. With the drivers 388.71, the performance was further boosted. 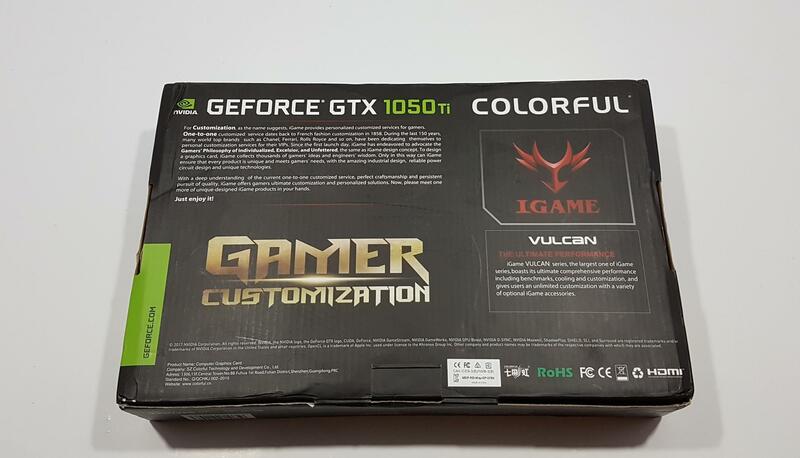 I am thankful to GearBest for providing me the Colorful iGame GeForce GTX 1050Ti Vulkan U 4G EC for the review. Check them out by clicking here. 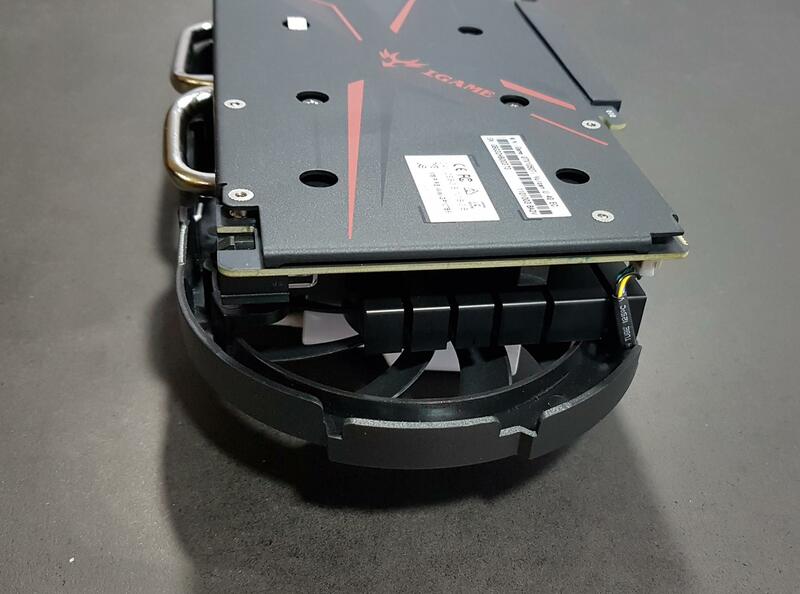 The Colorful iGame GTX 1050Ti Vulkan U 4G EC has a beautiful design with colorful shroud featuring powerful cooling solution with Blaze DUO 90mm fans and black color aluminum heat sink with two nickel plated 8mm heat pipes. It has a One-Key Overclocking feature. There is a Full-Armor metallic backplate on the backside of the card. The card has given an outstanding performance on the Full HD resolution and given its price range it is too good a deal to overlook.